Last Gasp: Put a Heavy Battleaxe into your hand. 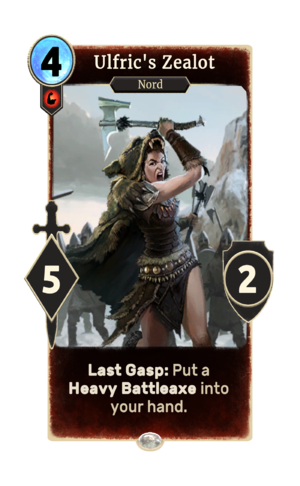 Ulfric's Zealot is a common Strength creature card. It is part of the Heroes of Skyrim expansion. "I'll take 'em all myself if I have to." This page was last modified on 27 February 2019, at 19:43.